At Man With A Van Glasgow we provide 24 hour man and van hire seven days a week throughout North / South Lanarkshire and Glasgow. 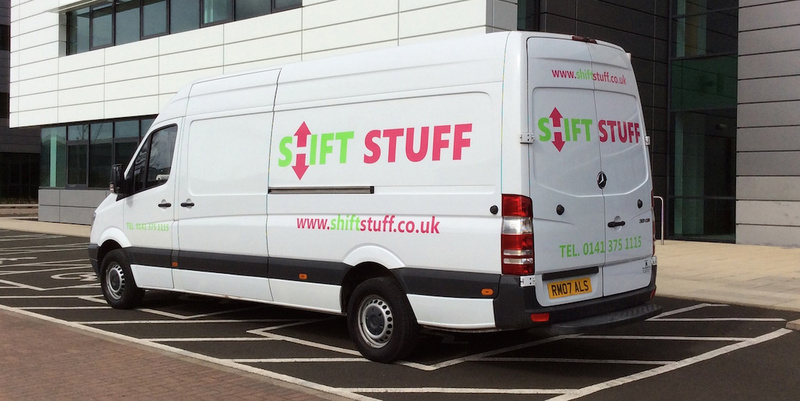 We have the ability to carry out same day collections for urgent deliveries or small removals. Operating several vans enables us to move anything, anywhere at anytime. From single item removals, sofa moves, full house removals, urgent overnight courier services and house clearances we can respond on the same day in Glasgow, Lanarkshire, East Kilbride, Motherwell, Cumbernauld and throughout west central Scotland. Simply call us on 07990 661540 for a quotation. Operating a fast same day man and van hire service our previous customers compliment us on the professional, reliable and friendly removal services we undertake. Our van with driver hire is available to either commercial or residential customers day and night. Short distance or long distance man with a van enquires are welcome, we are a local well respected small removals company serving Lanarkshire and Glasgow that you can trust. There are several man and van hire companies in Glasgow, man with a van Glasgow is trusted, reputable and reliable. Regardless of how big or small your removal or house clearance may be we can help. The majority of the regular removals and overnight courier work we undertake comes through customer referral, word of mouth and consistent repeat business from our happy customers. We have completed many long distance man and van removals from Glasgow to London, Manchester, Newcastle, Edinburgh and many other locations around Scotland, England and the UK. Moving practically anything, anywhere, anytime man with a van Glasgow can collect and deliver single items, Beds, Bicycles, Boats, Boxes, Caravans, Contract Deliveries, Ebay Pickups, Electrical Appliances, Emergency Courier, Flat Moves, Freight, Gumtree Pickups, Houses, Household Furniture, Jet Skis, Mattresses, Motorbikes, Office Furniture, Office Removals, Stock, Pallets, Trailers. We also provide pick-up services from all leading retailers and can collect your DIY and flat pack furniture delivering it directly to your door. Furthermore, we also provide a prompt, reliable and confidential man and van courier service for businesses and organizations of all shapes and sizes throughout central Scotland. At man with a van Glasgow we have highly competitive affordable removals and courier prices and currently the best available in the local area, it works our cheaper than van hire. We look forward to providing you with the very best removals, house clearance, man and van hire, courier and transport solutions. Contact us and tell us what’s required. Confirm the time and date you require your man and van. Man with a van arrives, completes the job, you pay the driver. It’s as easy as 1, 2, 3! For a free quotation contact man with a van glasgow today on 07990 661540. Get A Van And Man Quote Now! Man and van covering Airdrie, Bellshill, Bearsden, Bishopbriggs, Blantyre, Bothwell, Busby, Cambuslang, Carfin, Carluke, Coatbridge, Cumbernauld, Dennistoun, East Kilbride, England, Glasgow, Glasgow City Centre, Glasgow East End, Glasgow Southside, Glasgow West End, Glenboig, Glenmavis, Hamilton, Holytown, Kingspark, Kirkintilloch, Lanark, Lanarkshire, Larkhall, Lenzie, London, Manchester, Milngavie, Mossend, Motherwell, Newarthill, Newcastle, Newmains, North Lanarkshire, Lanarkshire, Rutherglen, South Lanarkshire, Stepps, Stonehouse, Strathaven, Thornliebank, Thorntonhall, Uddingston, Viewpark, Wishaw. © Copyright 2008-2018 www.manwithavanglasgow.org.uk. Man With A Van Glasgow. All rights reserved.